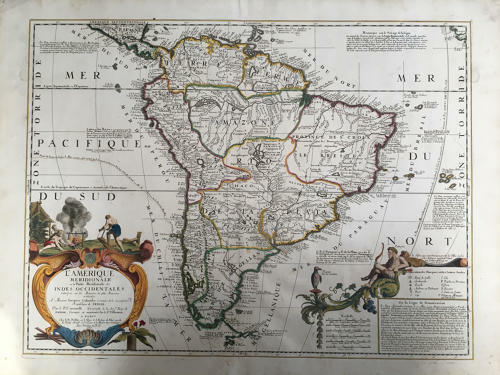 A fine example of Nolin's elegant map, compiled and engraved in Paris in collaboration with Vincenzo Maria Coronelli, who was then working in Paris on grand Celestial and Terrestial Globe for the King of France. The cartographic content is largely identical to Coronelli's two-sheet map of Europe, which was likely issued shortly after Nolin's map. The map is beautifully engraved and exhibits the detail and fine craftsmanship which is characteristic of Nolin's work. This example, in full original color, is of particular note. Seldom seen on the market. In very good condition with only minor soiling.